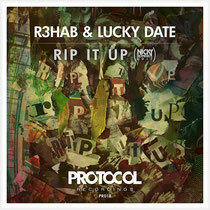 Nicky Romero has released his edit of R3hab & Lucky Date's forthcoming single, ‘Rip It Up’, via his label, Protocol Recordings. Romero has taken the electro-infused progressive house track into his own hands for a new arrangement and some additional refinements. The original ‘Rip It Up’, due out on Monday December 23, takes on a pumping dynamic with segments including everything from distorted riffs to lush chords and razor-sharp synths. Nicky Romero gives ‘Rip It Up’ a festival-ready makeover as he follows up on his most recent releases, ‘S.O.T.U.’ with Sunnery James & Ryan Marciano and his remix of Zedd's ‘Stay the Night’. He keeps the original's electro segments, but reworks the first melodies and moves the progressive house chords to a more central part of the track. Following the melodic relief, he revamps the build with an exhilarating touch before returning to the electro segments. Nicky adds his style to give R3hab & Lucky Date's forthcoming debut release on Protocol a bit of his own flavour. Check it out below.